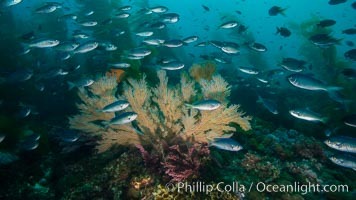 Blacksmith Chromis and California golden gorgonian on underwater rocky reef, San Clemente Island. The golden gorgonian is a filter-feeding temperate colonial species that lives on the rocky bottom at depths between 50 to 200 feet deep. Each individual polyp is a distinct animal, together they secrete calcium that forms the structure of the colony. Gorgonians are oriented at right angles to prevailing water currents to capture plankton drifting by Chromis punctipinnis, muricea californica, Chromis punctipinnis, muricea californica Photo. 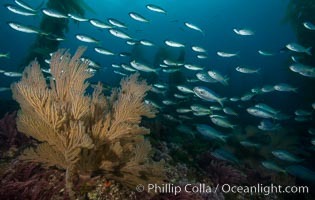 Blacksmith Chromis and California golden gorgonian on underwater rocky reef, San Clemente Island. 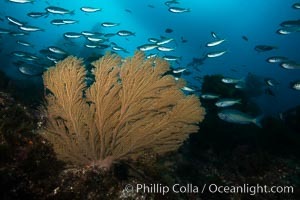 The golden gorgonian is a filter-feeding temperate colonial species that lives on the rocky bottom at depths between 50 to 200 feet deep. Each individual polyp is a distinct animal, together they secrete calcium that forms the structure of the colony. Gorgonians are oriented at right angles to prevailing water currents to capture plankton drifting by Chromis punctipinnis, muricea californica, Chromis punctipinnis, muricea californica Picture. 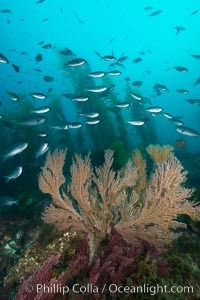 Red gorgonians and California golden gorgonians on rocky reef, below kelp forest, underwater. The red gorgonian is a filter-feeding temperate colonial species that lives on the rocky bottom at depths between 50 to 200 feet deep. Gorgonians are oriented at right angles to prevailing water currents to capture plankton drifting by Stock Photography of Chromis punctipinnis, muricea californica, Chromis punctipinnis, muricea californica. 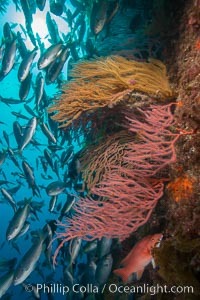 Blacksmith Chromis and California golden gorgonian on underwater rocky reef, San Clemente Island. The golden gorgonian is a filter-feeding temperate colonial species that lives on the rocky bottom at depths between 50 to 200 feet deep. Each individual polyp is a distinct animal, together they secrete calcium that forms the structure of the colony. Gorgonians are oriented at right angles to prevailing water currents to capture plankton drifting by Photograph of Chromis punctipinnis, muricea californica, Chromis punctipinnis, muricea californica. 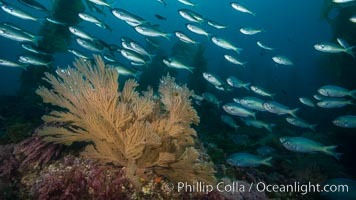 Blacksmith Chromis and California golden gorgonian on underwater rocky reef, San Clemente Island. The golden gorgonian is a filter-feeding temperate colonial species that lives on the rocky bottom at depths between 50 to 200 feet deep. Each individual polyp is a distinct animal, together they secrete calcium that forms the structure of the colony. Gorgonians are oriented at right angles to prevailing water currents to capture plankton drifting by Chromis punctipinnis, muricea californica, Chromis punctipinnis, muricea californica Photos. 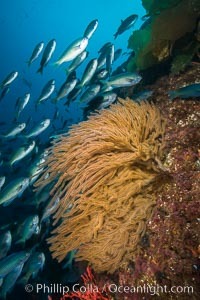 Blacksmith Chromis and California golden gorgonian on underwater rocky reef, San Clemente Island. The golden gorgonian is a filter-feeding temperate colonial species that lives on the rocky bottom at depths between 50 to 200 feet deep. Each individual polyp is a distinct animal, together they secrete calcium that forms the structure of the colony. Gorgonians are oriented at right angles to prevailing water currents to capture plankton drifting by Chromis punctipinnis, muricea californica, Chromis punctipinnis, muricea californica Image. 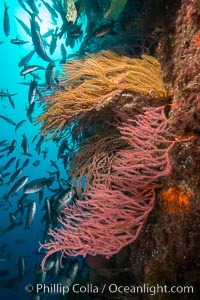 Blacksmith Chromis and California golden gorgonian on underwater rocky reef, San Clemente Island. The golden gorgonian is a filter-feeding temperate colonial species that lives on the rocky bottom at depths between 50 to 200 feet deep. Each individual polyp is a distinct animal, together they secrete calcium that forms the structure of the colony. Gorgonians are oriented at right angles to prevailing water currents to capture plankton drifting by Professional stock photos of Chromis punctipinnis, muricea californica, Chromis punctipinnis, muricea californica. 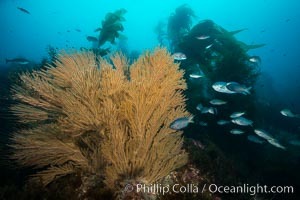 Blacksmith Chromis and California golden gorgonian on underwater rocky reef, San Clemente Island. The golden gorgonian is a filter-feeding temperate colonial species that lives on the rocky bottom at depths between 50 to 200 feet deep. Each individual polyp is a distinct animal, together they secrete calcium that forms the structure of the colony. Gorgonians are oriented at right angles to prevailing water currents to capture plankton drifting by Pictures of Chromis punctipinnis, muricea californica, Chromis punctipinnis, muricea californica. 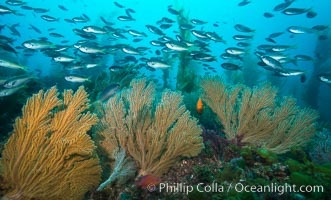 Red gorgonians and California golden gorgonians on rocky reef, below kelp forest, underwater. The red gorgonian is a filter-feeding temperate colonial species that lives on the rocky bottom at depths between 50 to 200 feet deep. Gorgonians are oriented at right angles to prevailing water currents to capture plankton drifting by Chromis punctipinnis, muricea californica, Chromis punctipinnis, muricea californica Picture. 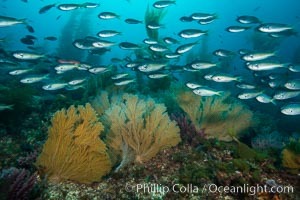 Blacksmith Chromis and California golden gorgonian on underwater rocky reef, San Clemente Island. The golden gorgonian is a filter-feeding temperate colonial species that lives on the rocky bottom at depths between 50 to 200 feet deep. Each individual polyp is a distinct animal, together they secrete calcium that forms the structure of the colony. Gorgonians are oriented at right angles to prevailing water currents to capture plankton drifting by Stock Photography of Chromis punctipinnis, muricea californica, Chromis punctipinnis, muricea californica. 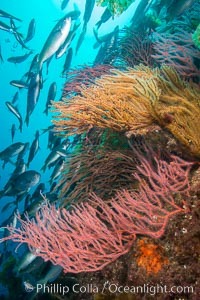 Red gorgonians and California golden gorgonians on rocky reef, below kelp forest, underwater. The red gorgonian is a filter-feeding temperate colonial species that lives on the rocky bottom at depths between 50 to 200 feet deep. Gorgonians are oriented at right angles to prevailing water currents to capture plankton drifting by Photograph of Chromis punctipinnis, muricea californica, Chromis punctipinnis, muricea californica.